Yesterday I had a couple of notable eagle observations in addition to the one mentioned in the Morning Observations entry. I climbed up a tree yesterday afternoon to enjoy the sunshine. As I was getting ready to climb down, I happened to look over towards the water and see two eagles lock talons and start spinning down. They separated before crashing into the ground and each flew away. It seems like I have read that kind of activity has something to do with mating. It is the first time I have seen it happen. Later in the afternoon, I noticed an eagle that looked like it was starting its molt into adult plumage sitting in a cottonwood tree nearby. I went over to take a closer look and saw there was a raven in the tree as well. 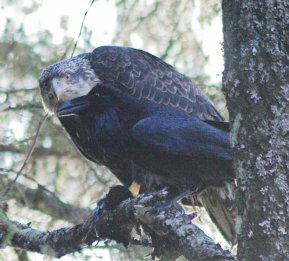 The raven started on the other side of the tree but moved over to perch right beside the eagle. It seemed that the raven was seeing how far it could press the eagle. As the raven moved closer, the eagle gave the raven a rather intense look (see the image accompanying this entry). The eagle made a slight move toward the raven and the raven decided to fly off to a different branch. At that point it made some interesting calls, including some beak clacking that I did not remember having heard before. (When I get my recording set up going, it will be interesting to document different types of raven calls.) I could not tell for sure, but I think the eagle may have had some food that the raven was hoping to be able to acquire.